It was right around the turn of the century that I conceived the idea of writing the biography of my spiritual master, Shrii Shrii Anandamurti. Being both a writer and a disciple, it was my dream assignment. I went to the monk in charge of the archives department, who had already spent nearly ten years interviewing Anandamurti’s disciples, colleagues, friends, and family, and he agreed to grant me access to his material. For the next six years I conducted my own interviews as well, traveling to different parts of India, an odyssey that was even more rewarding as a spiritual practitioner than it was as a writer. I got to spend numerous hours in the company of many highly evolved yogis and devotees, most of them in the final years of their life, listening to their stories and soaking up the spiritual vibes. And when it came time to write the book, which I began in 2006 and finished in 2010, it was like being back in my guru’s presence, a biographical dream that was also a kind of daily darshan. It was truly a privilege to have had the opportunity to write this book. While Paramahansa Yogananda may have been better known, Anandamurti was arguably the twentieth century’s most compelling and controversial spiritual figure. Considered by some to be a social revolutionary with secret intentions of overthrowing the Indian government and by others to be a powerful Tantric with supernatural powers, Anandamurti kept himself scrupulously hidden from the public eye throughout his lifetime. His only interaction with the public was through Ananda Marga, the spiritual and service organization he founded in 1955, and its thousands of orange-robed monks who by the late 1960s had become so ubiquitous in Northern India that they began drawing daily mention in the press and literature of the time. While Ananda Marga gained great notoriety, Anandamurti himself remained a mysterious figure in India until his death in 1990. 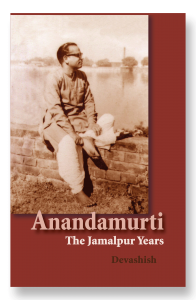 Based on the oral histories of his disciples, colleagues, and family, Anandamurti: The Jamalpur Years unveils a remarkable portrait of this often misunderstood saint and social thinker. Rather than being an academic study of one man’s life, Anandamurti is primarily a collection of devotional and mystical stories set in a biographical framework that provides the reader with a portal into the magical world of Indian mysticism, yoga, and Tantra.